Picture a classroom with five minutes left before dismissal. For me those last few minutes were too often filled with chaos—trying to wrap up activities, tie up student learning, and determine student understanding all before that final bell chimed. That chaos, although controlled, always bothered me as a teacher. After all the time spent lesson planning I couldn’t help but feel I was missing the boat by not ending the class with a more meaningful learning experience. 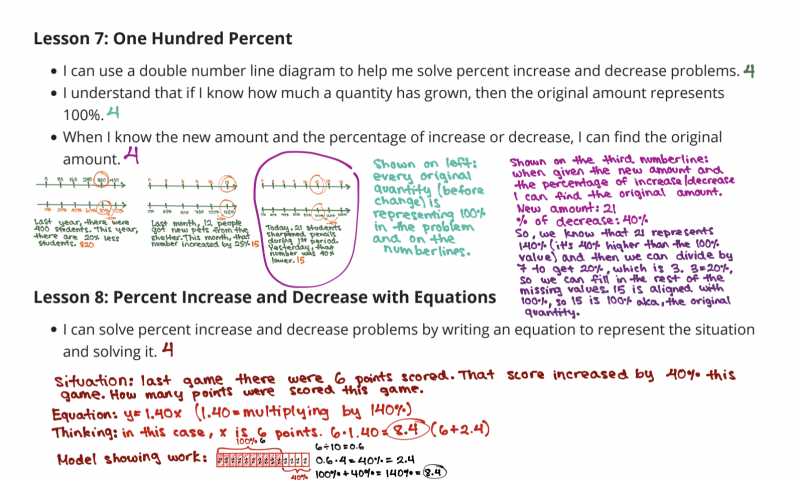 Once I began using Open Up Resources 6–8 Math, I felt drawn to the My Reflections resource located in the curriculum; I saw a chance to get kids talking about their learnings from the day, evaluate their understanding, and actually write in math class. I knew I had to take this opportunity to make math class better. We begin each class each day discussing and clarifying the learning targets so that students have a strong foundation to frame their learning around. Recently, students asked me to start rewriting these learning targets as questions and I gladly obliged (I consider it a win-win situation any time students are invested enough in their learning to ask me to make adjustments). This takes about 1 minute of our class time. After we’ve started class and framed our learning, we do the activities following the recommended strategies, groupings, and timings that are in the Open Up Resources 6–8 Math curriculum. Depending on the learning of the day, this accounts for 30 to 35 minutes of our class. Next is where my favorite 6 to 7 minutes of class begins—student reflection time. The first step in reflecting on their learning is for students to rate themselves on a 1–4 scale based on their understanding. After students rate themselves they must explain in writing what they learned but it has to go beyond just regurgitating the material back at me. Students must really write something that enhances the reader’s understanding of the topic at hand. I ask students to imagine they were explaining their learning to a friend who missed class that day. What would they say? What language would they use or clarify? Are there generalizations that can be drawn or multiple pathways that can be used to problem solve? In what real life contexts are the skills useful? Finally, students create and solve a problem using their learning from the day to show that they can apply what they learned to a new situation. Once students have completed their individual reflection I randomly select a table to present the best reflection out of their group of four. I use the Team Shake app to facilitate this, but there are many random generators available for free! Allowing the table of four to select one person to present eliminates the potential embarrassment of cold calling on one student and the embarrassment that can come if they don’t have a reflection complete. The facilitator calls on students who have hands up and the note-taker writes down student responses on a sticky note to hand to the person whose work was selected so he/she can make improvements, if desired. Students have now seen modeled work and created a scale for quality work in their own minds that they can compare to their own. The presentation and feedback component takes around five minutes of our time and then class ends on this reflective high note. In order to hold students accountable for completing these reflections, I collect these on the day of the Unit Test, and assign two grades. They receive one grade as a reliability/completion grade and another as an academic grade where I select 1 to 2 of the lessons that I feel best hit the standard I wanted them to know, and this counts as 50% of their grade for the unit. I honestly feel I learn as much reading through the targeted reflections I select as I do grading their Unit Test! They give me a true glimpse into how a student thinks about and understands the material. It makes me proud to see how much learning has happened every 3-4 weeks when I read these. Furthermore, students are becoming reflective learners and are developing habits of continuous improvement, and that is a skill that can help drive each of them to reach their potential. 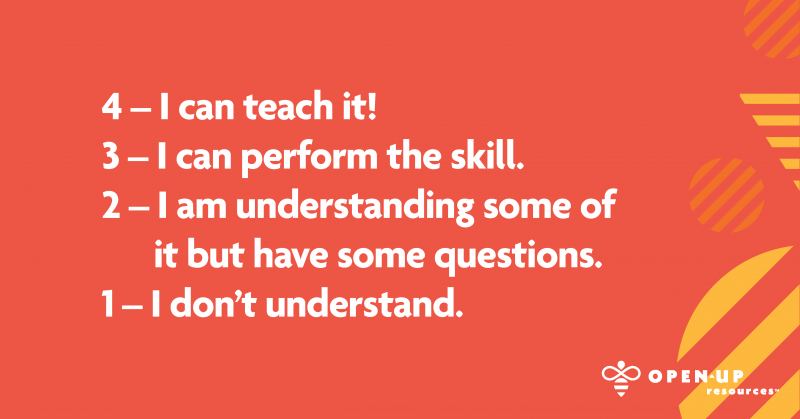 Q: How can I give up another 3–5 minutes of my class? A: I totally understand that every minute is valuable but so is peer to peer feedback. This 3 to 5 minutes is well spent so that students can clarify their misunderstandings, affirm their own understandings, and and learn what exemplar work looks like so they know what is expected of them. That’s worth it to me. Q: I’m not a language arts teacher, do I have to grade writing? A: I won’t lie, it does take time to grade these but you are also getting a great glimpse into student thinking! Not only are you evaluating student learning but also the efficacy of your own teaching as you see what understandings students took away from each lesson. Q: Isn’t this too hard for my struggling students, students with disabilities, or english language learners? A: Those are exactly the students that need to reflect on their learning the most. They need a chance to demonstrate their thinking. You may need to get them started with sentence stems or starters but they deserve a chance to see exemplar work and share what they have learned. Reflection is something that is accessible to most students at their own level, so it is a natural way to meet all learners needs and evaluate their understanding in a non-test setting. No one knows how effective the student reflections have been at transforming my classroom better than my students themselves. I have received so much feedback from students on how much this process has helped them, but also on how to improve it, such as rewriting the learning targets as questions. My students have been the ones who have evolved these over time to be more colorful, organized, and impressive. They are owning their work and that is a win for me as a teacher.